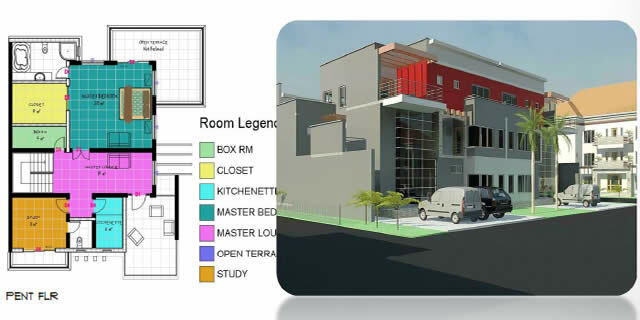 The goal of this design proposal is to provide a befitting accommodation to the staffs of National Institute for Legislative Studies (NILS) using some architectural technique to rightly apply metal, concrete, glass, artificial/natural lightening and beautiful colours, to give comfort, security and aesthetics to the end users. 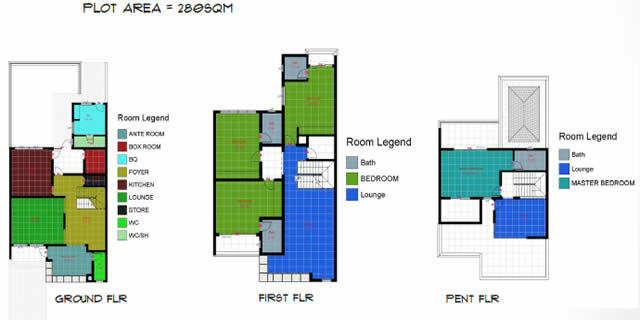 But for now this design proposal is limited to items a - f.
The brief is for the design of a proposed estate for National Institute for Legislative Studies which will bring together the following Houses/facilities:- 4-Bedroom Town Row Houses, 5-Bedroom Semi-Detached Duplex, 3-Bedroom Block of 6 Flats, 5-Bedroom Detached Duplex, Commercial Complex, Games/Recreational, A Standard Infrastructure, Landscaping, Police Station, Fence and Security Post and Estate Administrative Block. Our objective as COPEN GROUP is to design and construct an aesthetical, confortable and habitable housing estate for NILS. Location and sitting of building, plays a vital role in the functionality of a facility, so the buildings will be located where it can easily be seen for easy identification and description. 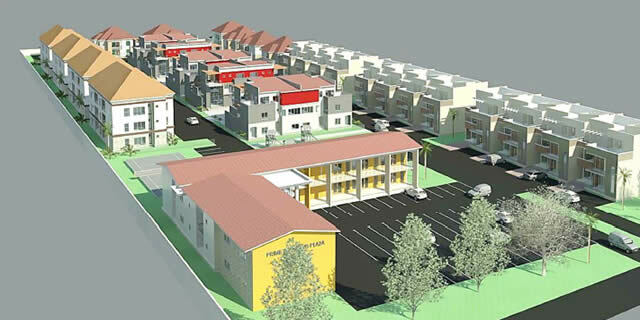 The commercial buildings will be located close to the estate entrance, the 4-bedroom town row houses and the 3-bedroom block of 6 flats will be located at the longer side of the layout, and the 5-bedroom luxury semi-detached duplex will be located at the central part of the layout, while the 5-bedroom detached duplex will be placed right inside the layout for quietness and security because of the caliber of the occupants. 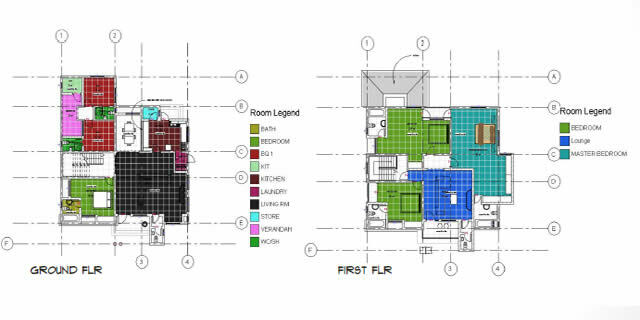 Proper functional flow and circulation are two major design considerations in this project. This is to avoid any clashes between functions in the estate. Human traffic will be given precedence over Vehicular traffic; this is because the design proposal is for human accommodation and comfort. Proper Vehicular traffic flow was also taken into consideration as measured ergonomics and anthropometrics was one of the bases of this design. - Above the ground features such as electrical cable, and telephone cables. - On the ground features such as vegetation, valley, shrub, and tress. - Below ground features such as underground water and sewage pipes. 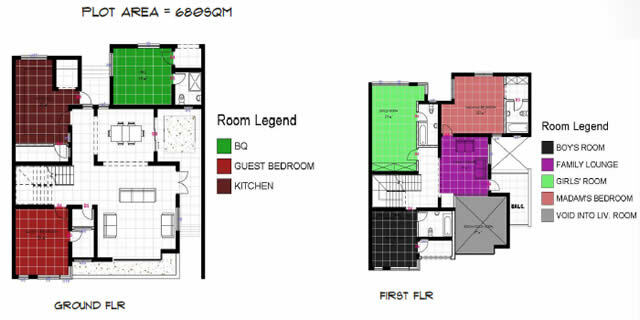 - Spatial pattern; significant view from the site and towards the site. - Vehicular circulation pattern showing existing roads as well as access roads to the site. - Climatic factors and solar orientation e.g. rainfall, temperature, humidity, fog, and dust storm. - Natural features e.g. rock, tree, and ground cover. The site has not been allocated yet, but we are hoping that when the minister considers our application, he may probably allocate to NILS from either Kabusa or Kyami district layout. Therefore we are going to give an analysis of either of them because they are sharing the same climatic condition within the FCT. Kabusa district is located next to Lokogoma and Okange districts of FCT phase 3, while Kyami shares boundary with Idu industrial layout and Aviation layout along the airport expressway, Abuja. 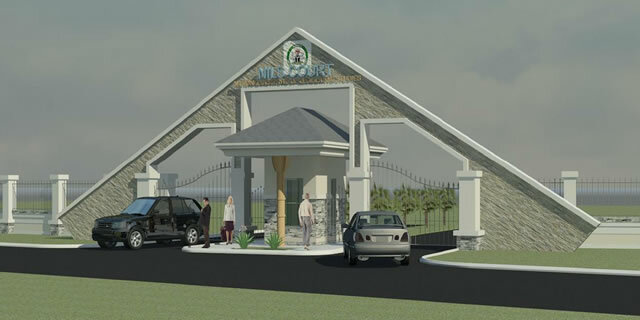 This design proposal is to be located at either Kabusa or Kyami district of Abuja, FCT. In choosing the site, many factors have been considered. 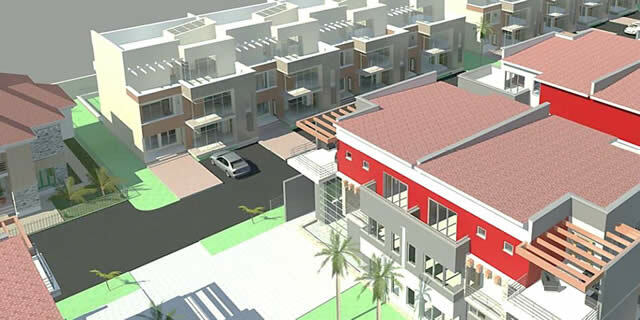 Some of which include new government regulation, which stipulates that all estate development should be located at the new phase 3 districts layouts of FCT and the buildings must not consume unnecessary space but accommodate more while the height should at least be more than 2 floors. The criteria for the selection of the site for the project are stated below. The water supply on the site is from water borehole for now the water boards` mains get there. 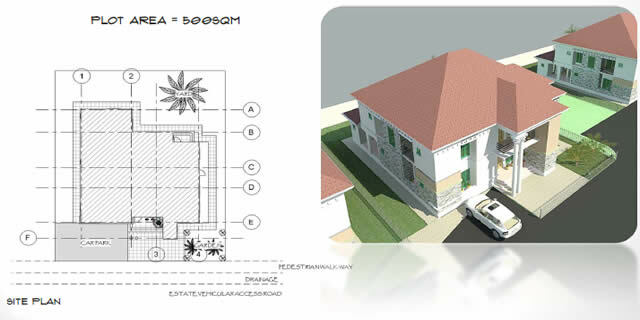 In other to get water into every plot, a pipe needs to be connected to the water borehole to supply water to each building. Facilities like telecommunication cables, electrical cable, roads and drainage gutters will be connected from the airport express way. The site slopes down gently from the eastern side of the site to the western side of the site. This slope would be utilized as the storm and drainage gutters and would be laid in the same direction as the slope, so that wastewater could flow due to the force of gravity out of the site. The refuse on site are collected at various points through a refuse bin provided and are disposed privately. Apart from the smaller bins incinerators will be provided for burning paper wastes. In order to aid proper removal of wastewater and rainwater from the site, adequate drainage channels constructed with reinforced precast elements will be provided and they will be properly covered with reinforced concrete slabs.